1) In the useless contest to see who can make the world’s longest cigar, Cuba’s José Castelar is second to none. 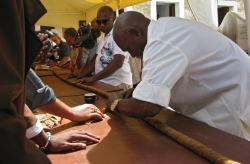 He recently doubled his previous record by rolling a 149-foot cigar during the annual International Tourism Fair in Havana. In his sixties, Castelar says he only smokes one cigar a day. But when your cigars are measures in yards and not inches, that’s still a lot of tobacco. He plans one day to roll a 10-kilometer cigar. 2) If you smoke inside, here’s some advice on what to use—and what to avoid—to clean the air. An environmental health professor told the New York Times this week that using incense and candles is “just combustion, and the smoke has the same health effects as cigarette smoke.” Another indoor-air expert suggested a HEPA filter for your air conditioner so it can function as an air cleaner on occasion. Less carpet also means fewer molecules trapped and re-released. 3) Inside the Industry: General Cigar Co. is sending retailers wine, beer, and spirit pairing suggestions on Punch and Hoyo de Monterrey cigars (the manufacturer suggests, for example, pairing a Hoyo de Tradición with a single barrel bourbon, an English nut brown ale, or a Cabernet Sauvignon). Famous Smoke Shop continues it’s exclusive releases in celebration of it’s 70th anniversary with a cigar by La Aurora featuring a Connecticut wrapper around a blend of Dominican, Brazilian, and Nicaraguan tobaccos. In a push for more members, Cigar Rights of America has announced that it will select one member each month to go on an a trip to visit a well-known cigar maker in either Nicaragua, Honduras, or the Dominican Republic. 4) Around the Blogs: Cohiba Club smokes a Fuente Hemingway Classic Maduro. Stogie Review checks out the Esencia. Keepers of the Flame reviews the Casa Magna. Matt lights up a Gran Habano 3 Siglos. 5) Deal of the Week: We haven’t tried the newest release from Cuban Crafters yet but, if it’s anything like their other creations, you’re in for a treat. And, since it’s on sale, now is a great time to try the Cubano Claro. Get yours here. To clean the air after smoking, a product called „Lampe Berger“ served well for me. I don't know if it really "cleans" the air but after some 30 minutes the cigar smoke is gone. I use it with the neutral oil. Another possibility for cleaning the air if you're handy and have a large room or club where you smoke is in the states and localities that have recently enacted smoking bans. The bars and restaurants that have smoke eater machines installed will likely be open to selling them at a bargain since the new laws make their investment basically worthless.